Sanyaso (wild grasses and flowers) is beautiful to display by itself. And it gets the doubly attractiveness in Yoseue (group planting). For fanciers, it is the happiest moment to arrange Yoseue with the images of flowers and colored leaves. We interviewed Yusuke Hashimoto, Hashimoto Seikoen bonsai garden in Takamatsu's Kokubunji town, about basic rules of Yoseue of Sanyaso. "It is important for Yoseue of Sanyaso to decide the position at the first. After that, you just have to put it out from a pot and plant." Hashimoto emphasizes the importance of position. It is said an odd number of trees is better. For the first time, it is easy to arrange 3 species of trees. About the point of trees in a pot, the scalene triangle is better than the equilateral one because sometimes it loses the balance. In addition, the season of flowers is also important. This time, he showed us how to make Yoseue of Daimonjiso (rockfoil), Kurehademari (Diabolo ninebark), Kusabotan (Clematis stans), Hatsuyukikazura (Asian jasmine 'Hatsuyukikazura'), and Chojubai (Japanese quince). For arranging the good one, take care of the direction and the height. Do not have to put all trees in a pot. The protruding parts make the good three-dimentional effect. You can learn by experience to choose the good species, positions, and pots. So be free at first. 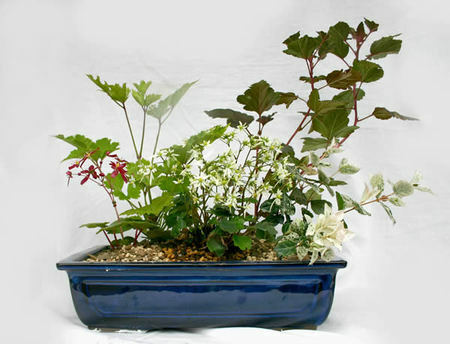 However it is preferable to avoid the loud colored pots which stand out from the plants. In the case of Yoseue, it is said the plants keep the original shape in the first year and they become natual from the second year. So their growth is one of the important elements. Most of Sanyaso plants are perennial and transplanted every 3 years. If you take much care of it such as the watering in summer and the temperature control in winter, the nature helps you to make the good Yoseue. Hashimoto says, "Compared with Shohaku, Sanyaso is cheaper and get less damage if you fail to arrange. Try to make your own Yoseue freely like to make a Utopia in a pot."